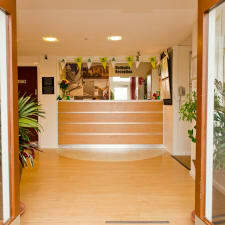 With panoramic views of Snowdonia, YHA Conwy offer comfortable, budget friendly accommodations. The hostel’s 82 rooms are all en-suite. Towels are not provided, but can be rented for a nominal fee. Ideal for families, YHA Conwy features laundry facilities, gardens, activity rooms and an archery range. Free Wi-Fi is offered in communal areas. Guests can prepare meals in the large self-catering kitchen, pre-book a full English breakfast and purchase packed lunches. The hostel features a licensed bar and kids eat dinner free at the on-site restaurant. More dining options are available in Conwy, just a short walk or drive away. An economical base for walking or touring holidays, YHA Conwy is convenient to Conwy Castle and Snowdonia and just a short drive to the beach. Other attractions in the area include Aberconwy House, the oldest dated dwelling in Wales and the RSPB Nature Preserve. The hostel's staff garnered praise for their friendly and helpful service and knowledge of the local area. Guests arriving late were met with a warm welcome and most said the hostel's staff went to great lengths to provide a memorable experience. Guests who had visited hostels in the past and those hostelling for the first time were equally surprised and pleased with their accommodations at YHA Conwy. They praised the clean and comfortable accommodations, the kitchen facilities, games room and children's play area. Some thought the hostel was better than some B&Bs and much more budget friendly, others said YHA Conwy completely changed their perception of hostel accommodations. Situated at the top of a hill, the hostel's location was a great hit with guests who raved over the spectacular views of Conwy castle, the surrounding countryside and the Mountains of Snowdonia. Guests also enjoyed the short and pleasant walk to the city centre. While most guests were very happy with the hostel's accommodations, a few noted improperly functioning showers. Others complained about the lack of soap and cost of renting towels which are not provided. The hostel offers free Wi-Fi in the communal areas, but a few guests would have preferred to connect from the privacy of their rooms. The steep climb to the hostel at the top of the hill was a problem for a few guests particularly those with heavy backpacks or luggage.